The Idaho Steelheads played a three-game series this past week against the Alaska Aces (Abbotsford Heat), but I think one would have to look past the results of the weekend, winning 1 out of 3, to perhaps appreciate exactly what the Steelheads may have gained out of this weekend. Looking at the scores alone doesn’t really give the entire picture. On Wednesday, the Steelheads lacked any real "compete" during the game as the Aces came into town riding a shutout streak, and there was nothing the Steelheads were going to do to break that up on this night. Pat Nagle was solid in defeat, and Connor Goggin played well defensively after starting the game as a 10th forward. Otherwise, there really wasn’t a lot of inspired hockey from Idaho. On Friday night, the team came out as you would expect after a couple of hard practices. They tilted the ice in their direction and broke the Aces shutout streak about ten minutes before they would have set the regular season record. Idaho took a 2-0 lead on some good fore-checking. After Brock Montgomery gave the team that lead, Alaska answered back with two goals in exactly a minute to tie the game at two all. Before all was said and done, the Steelheads left the ice trailing 3-2 after the first period. Despite getting a few good looks the remainder of the game, the Aces were able to get the better of goaltender Chris Carrozzi, who the Steelheads had picked up late last week, for a 5-2 win. Saturday was the culmination of small, stepped improvements. With Hubert Labrie returning to the line-up on assignment, the tone was set early when he made a huge hit right in front of the benches less than ten seconds into the game. It had yours truly retreating from the boards to avoid a wayward stick or two at impact and then having to reset all of my equipment down between the benches. The tone was set and once again the Steelheads broke out to a 2-0 lead. This time, however, the Steelheads were able to make it stick. Despite the Aces making it 3-2 on a deflected goal late in the third period, Justin Mercier's second of the night made it 4-2 just fourteen seconds later to take the wind out of the Aces' sails. Pat Nagle had his first game making less than 30 saves (26 of 28) and got the win. Overall, the weekend was a loss. Idaho lost two out of three games to the division leaders; that can’t be debated. The ultimate judge of this series will be: is this the weekend the Steelheads “bought in”? Is this when all the different contracts (ECHL, AHL, NHL) and all the personal expectations, and all individual freewheeling get cast aside for the only thing that matters? Team expectations. The Idaho Steelheads are a team that historically will not only make the playoffs but make deep runs towards a championship. The team that was playing the first eight games of the year was disjointed, at times selfish and did not play a physical brand of hockey. The team that played in game nine that beat the Aces was physical, imposing, relentless and never wavered from their goal of winning the game that night. If that is the team that shows up more often starting Wednesday night, I would expect another deep run into the playoffs. The power play went 0 for 10 this weekend. The penalty kill went 8 for 11 this weekend. Hubert Labrie: Played only one game on a quick re-assignment tour before getting called back on Tuesday. Labrie contributed no points in his game (three on the season) but provided the physical spark right from the drop of the puck. Was a factor all night and contributed in many other ways that won’t show up on the scoreboard. Carl Sneep: Not going to sugarcoat this one too much. Sneep so far this season has not been very good. He has shown signs at times of his pedigree of a highly drafted player. Right now he is at minus-9 on the season and only has two assists. I would like to see more of a consistent effort out of him on a night-in and night-out basis. With so many young defenseman, he could really be looked upon as a leader with a bit more consistent play. Pat Nagle: Over his six games played this season, Nagle is now sporting a 3.08 GAA as well as a .909 SV%. Both of these numbers have been heading in the correct directions since the beginning of the season. Nagle is a guy that really seems to be getting comfortable with how the team is going to play in front of him and what his expectations are. There are still little things that he needs to work on, but if he can continue to improve as he sees more ice time the Steelheads could be in a great position of having a 1/1A when/if Josh Robinson gets back down to Boise. The Steelheads have another three game week coming up as the Ontario Reign (Manchester Monarchs, St John’s IceCaps) come back to town on Wednesday. 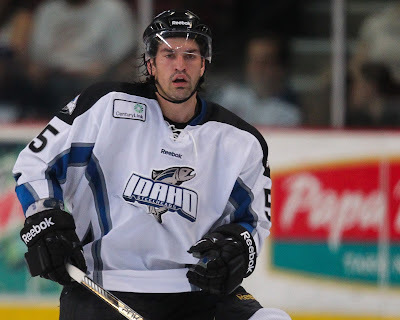 The Steelheads then take to the road for a two-game set against the San Francisco Bulls (Worchester Sharks) and former Star Tyler Beskorowany on Friday and Saturday.